Last night Stuart and I went to see Richard Bean's fabulous new play Young Marx, the opening production at the new Bridge Theatre in London's glitzy London Bridge Quarter. The Bridge Theatre is the new commercial theatre founded by previous National Theatre artistic director Nicholas Hytner and executive director Nick Starr. Young Marx stars Rory Kinnear in the title role and Oliver Chris as Friedrich Engels and reunites the creative team of Bean's previous hit play One Man Two Guvnors (which premiered at the National Theatre), directed by Hytner, designed by Mark Thompson, music by Grant Olding, lighting by Mark Henderson and sound by Paul Arditti. 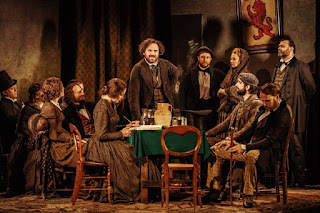 Aping a Restoration Comedy the action is set in 1850, and Europe’s most feared terrorist is hiding in Dean Street, Soho. Broke, restless and horny, the thirty-two-year-old revolutionary is a frothing combination of intellectual brilliance, invective, satiric wit, and child-like emotional illiteracy. Kinnear and Chris are both great. The writing is funny, and there is a lot of vaudevillian, hammy role-playing, and slapstick humour to be had. But there is perhaps something slightly missing from the whole show though. Maybe it just needs a few more wry jokes about Capitalism, a bit more pathos about the terrible conditions of the Manchester cotton workers that spurned Engles on, or a simply just a few more knob gags. Overall a great show in a great theatre. We are both looking forward to seeing what else the place has in store. Hi i am glad to meet your here. Your post is really nice to read and get more offers from here. Most of the students can get opportunity for training about writing documents from writing company . Legal restrictions can be followed for making law dissertation, articles etc.